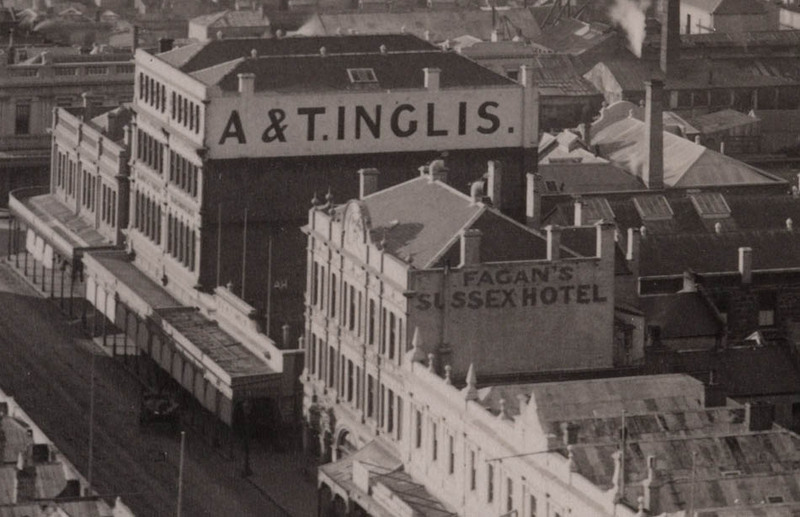 There were eighty-nine licensed hotels in Dunedin in 1865, and that year the original Sussex Hotel was added to their number, making twelve pubs in George Street alone. A simple single-storey wooden structure, its first licensee was Henry Pelling, who was followed by Alfred Lawrence, Daniel Bannatyne, and then Thomas Oliver. Additions at the back designed by W.T. 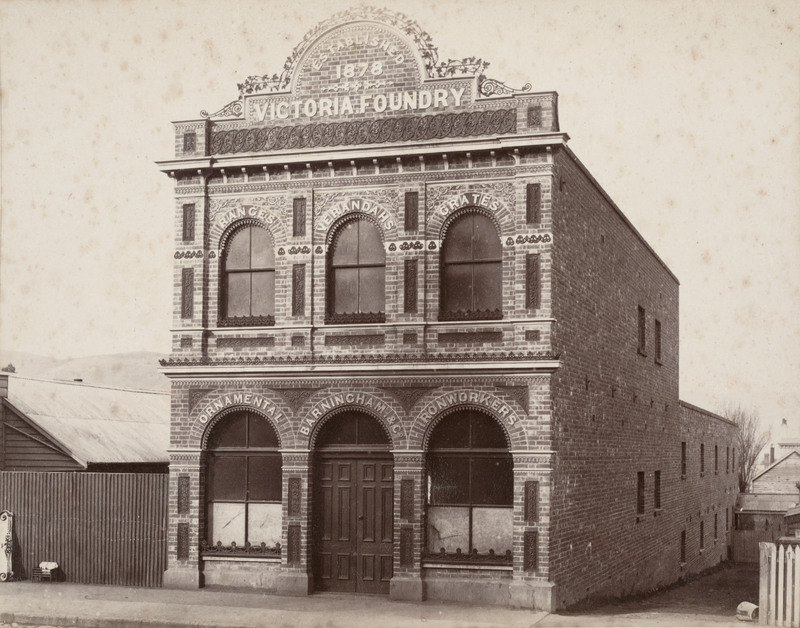 Winchester were built in 1877, and three years later Oliver had the front portion rebuilt at a cost of over £4,000, creating the three-storey brick building seen from the street today. The architect was Robert Forrest (c.1832-1919), whose other designs included the Excelsior, St Kilda, Green Island, and Outram hotels. 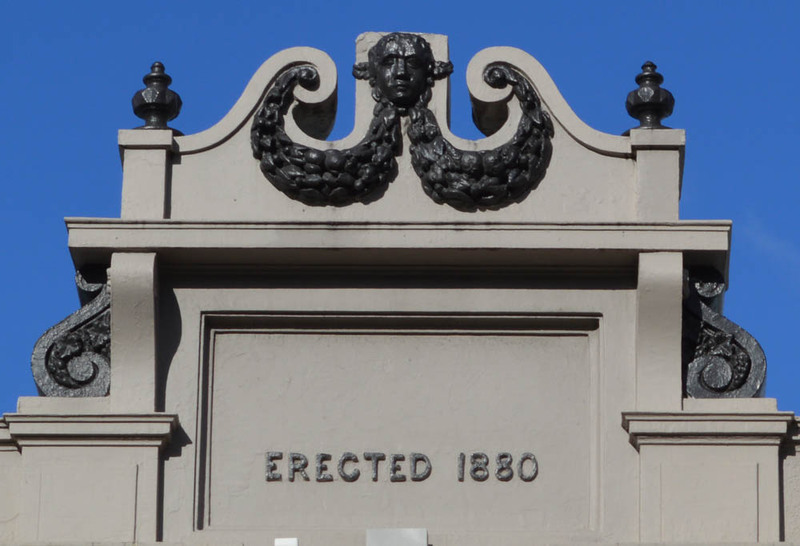 The facade was in the Renaissance Revival style, with massive pilasters running between the top two floors, and an unusual curved corner at the entrance to Blacket Lane. 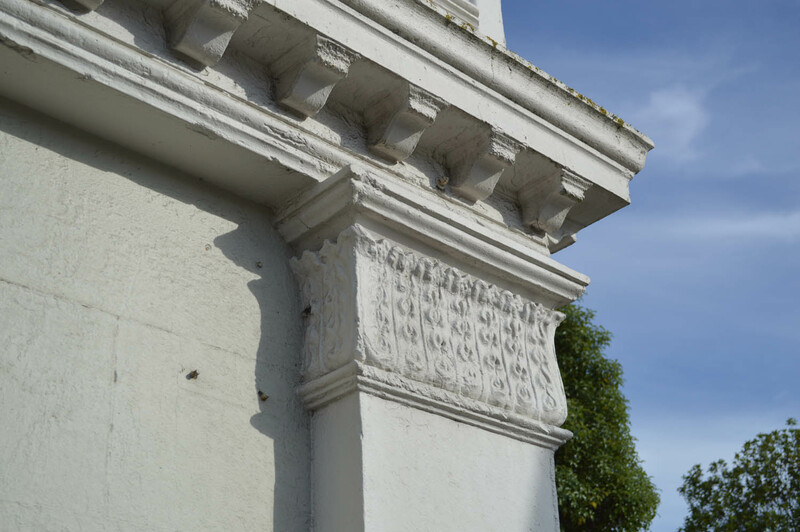 There were originally more mouldings than there are now, as well as an arched pediment and finials prominent on the parapet. The builder was John Brennan and the building was complete by June 1880. 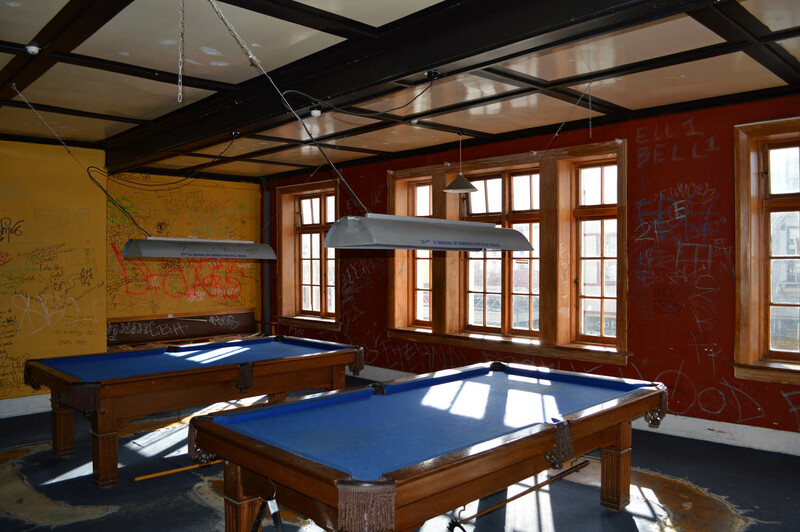 The hotel contained a bar, two parlours, a sitting room, a large number of bedrooms, dining room, billiard room, and a skittle alley. There were also two shops, with dwelling rooms above them on the first floor, and on the top floor was the Sussex Hall. This had room for 200 people, and events held there in the 1880s included dinners, concerts, dances, workers’ meetings, election meetings, wrestling matches, and boxing classes. 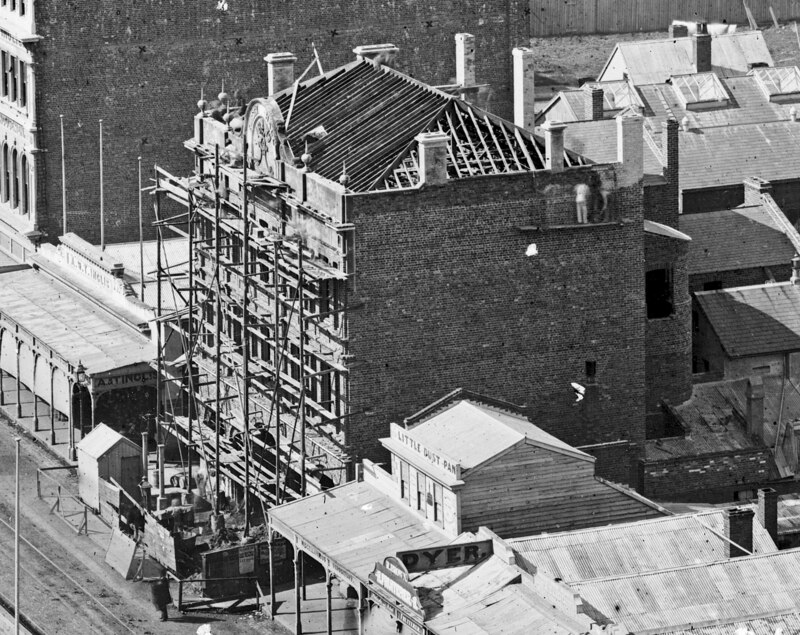 The Sussex Hotel under construction in 1880. Ref: Te Papa C.012110. Cropped detail from Burton Bros photograph. Again, a little later. Ref: Te Papa C.018407. Cropped detail from a Burton Bros photograph. The hotel was said to have had an unusual patron in its early years. Margaret Paul, historian of the neighbouring A. & T. Inglis department store, tells the story of Antionio, a ‘mansized ape’ that belonged to eccentric store owner Sandy Inglis. The story goes that Antonio, often found dressed in an admiral’s uniform, was served drinks at the hotel. He was also allegedly involved in incidents that included his assault of a barman who had doctored his drink, an unsuccessful attempt to ride a horse (not his idea), and a scene at Port Chalmers when he threw lumps of coal at well-dressed locals returning home from church. Sadly, it is said he was shot after having a go at Sandy himself. Of course legend is typically more colourful than real events, but a newspaper of 1881 records that Inglis did a least own a ‘celebrated South African monkey “Antonio”’, and that he attracted the ‘wonder of an admiring multitude of small boys’ on at least one parade. Inglis also acquired a baboon, and both of the poor animals had been brought to Dunedin by Captain Labarde of the Pensee, and exhibited at the Benevolent Institution Carnival in 1880. 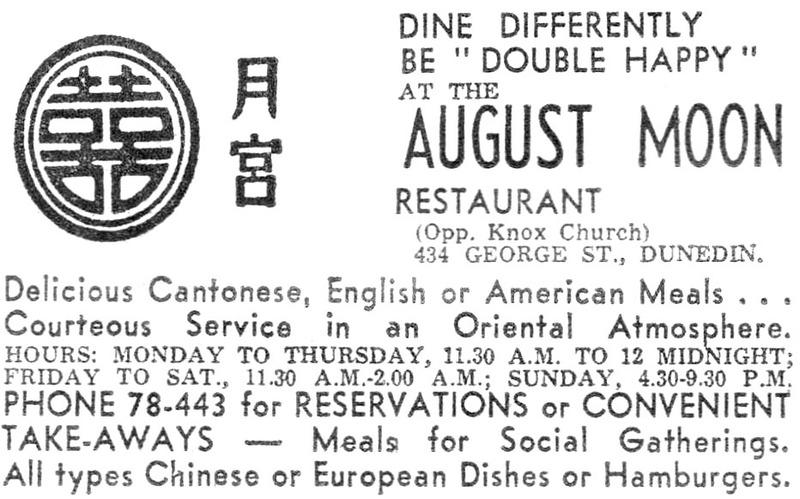 An advertisement from the Otago Daily Times, 28 June 1894. 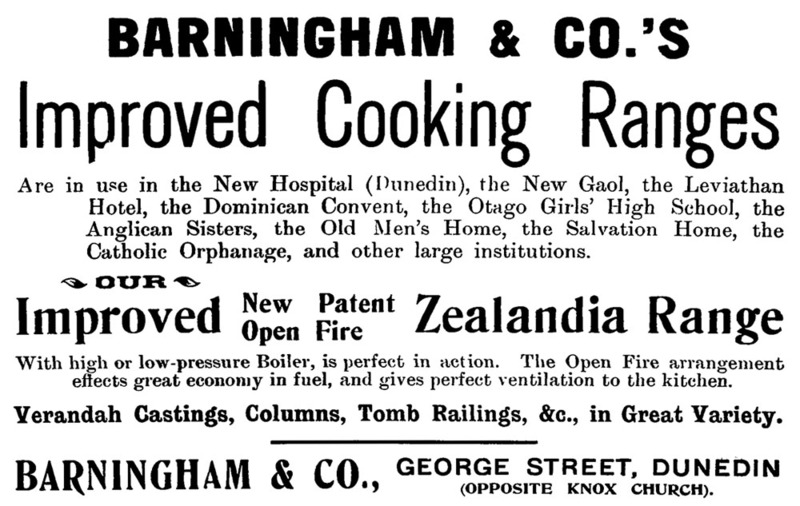 Thanks to Papers Past, National Library of New Zealand. Licensees after Oliver (though he retained ownership of the building) were Thomas McGuire, Michael Fagan, John Toomey, and Joseph Scott. 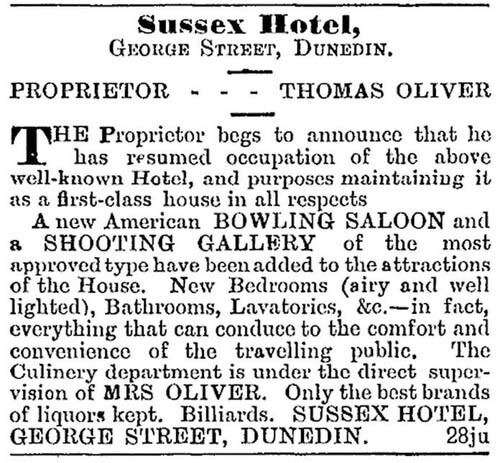 Oliver returned in 1894 and improvements made at that time included a new ‘American Bowling Saloon’ and a rifle gallery. The license transferred to Jessie Guinness in 1896, and then after her marriage to her new husband, John Green. 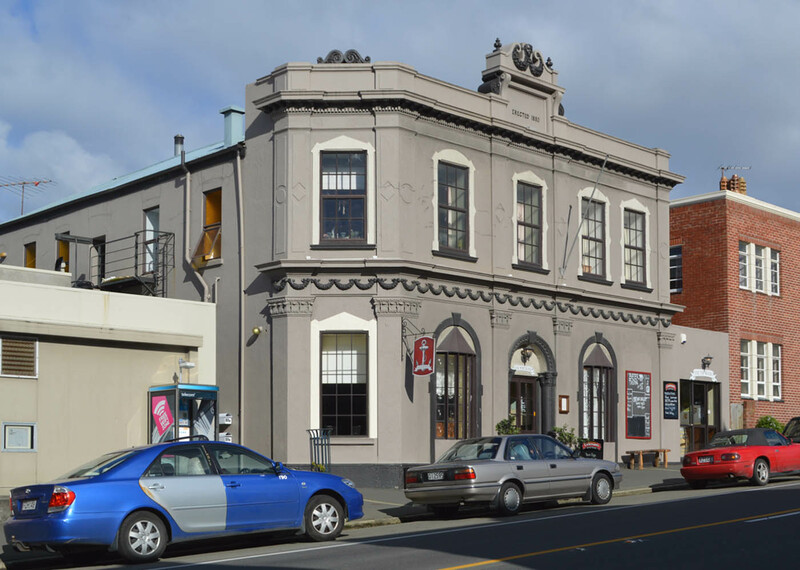 The hall was used as band and social rooms, and for some of Dunedin’s earlier screenings of motion picture films. An unusual event in 1902 included J.D. Rowley’s Waxworks of Celebrities, a cyclorama (panoramic images on the inside of a cylindrical platform), a Punch and Judy show, a mechanical organ, and a penny-in-the slot machine ‘which purports to reveal the future and inform the inquirer what is the nature of the matrimonial alliance he or she is destined to contract’. In 1902 a vote was passed reducing the number of hotel licenses, and the following year the Sussex Hotel’s days as a pub came to an end, although it continued as a private hotel for a few more years. Its next phase was as Wardell’s Building. 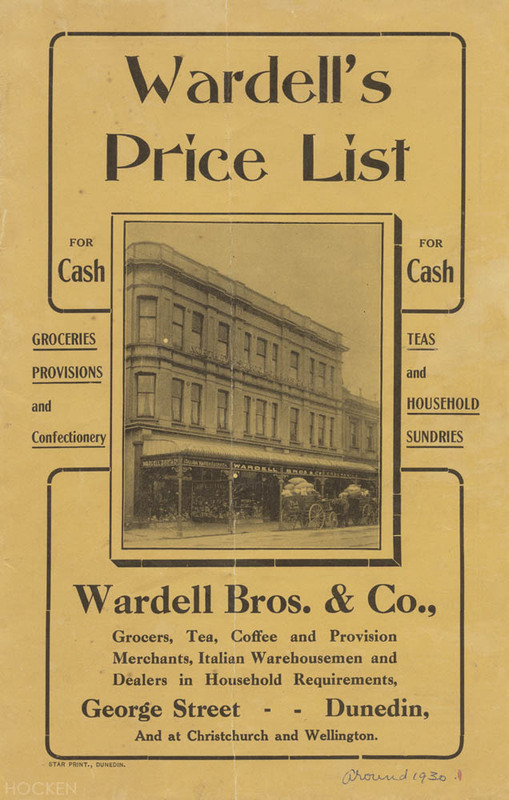 The grocers Wardell Bros & Co. opened a grocery store on the site in 1907, having first established outlets in Dunedin and Christchurch in 1889, and a branch in Wellington in 1893. 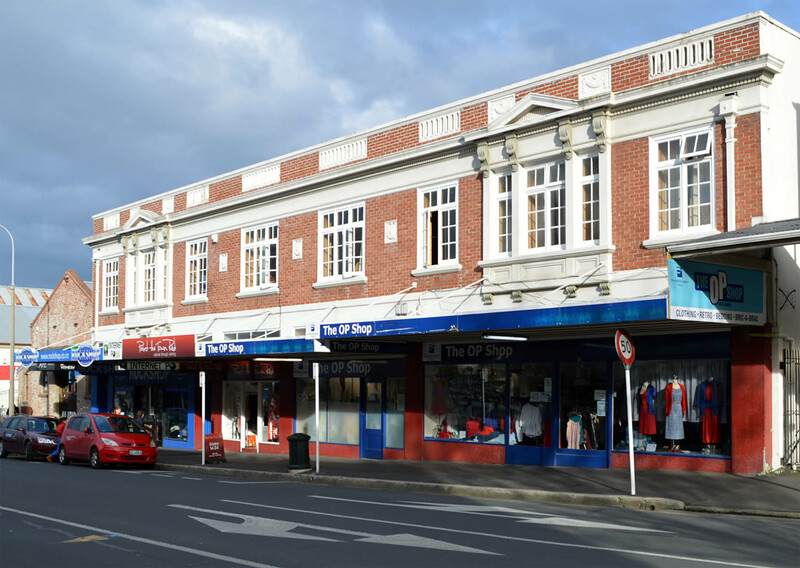 For many years Wardells was the largest store of its type in Dunedin, known for its free home delivery service, and for stocking products not available elsewhere, such as specialty cheeses. A Wardell’s price list from 1930. Ref: Hocken Collections MS-4076/001. 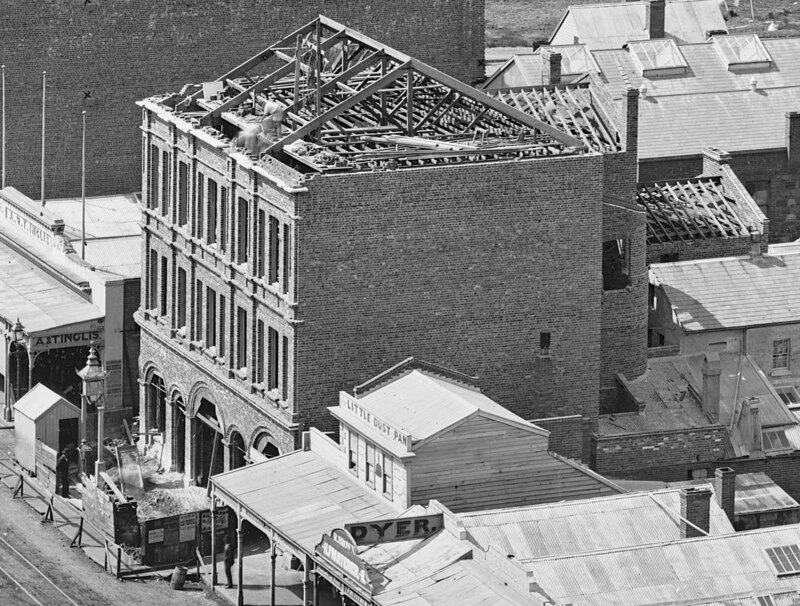 One of the most notorious New Zealand riots centred on Wardells during the Great Depression. On 9 January 1932, hundreds of unemployed workers protested in George Street demanding food relief, and attempted to break into the store. A window was broken but the crowd was unsuccessful in its attempts to get past police. 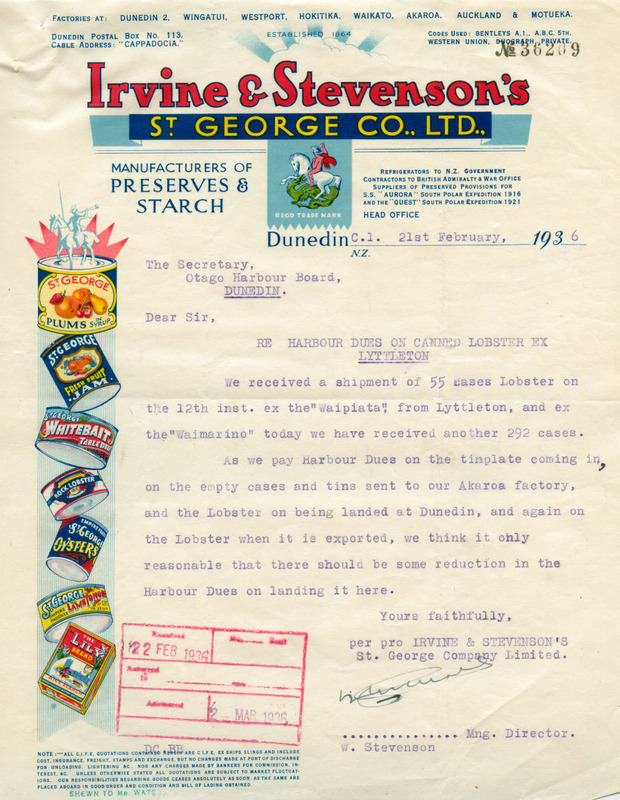 In 1935 the Dunedin business became a separate entity registered as Wardells (Dunedin) Ltd, which leased premises from a separate Wardell family company. In 1958 the store was converted to a self-service ‘foodmarket’ and outlets later opened in South Dunedin and Kaikorai Valley. Free deliveries ended in 1972 and in 1974 the firm was sold to Wilson Neill Ltd, which closed the George Street store in June 1979. 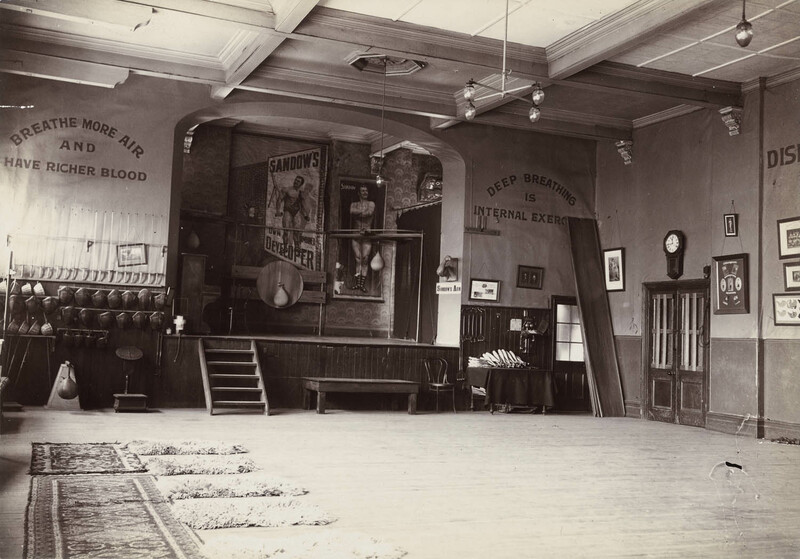 From its earliest years the Sussex Hall was used for boxing classes, and for followers of the health and strength training movement known as Physical Culture. 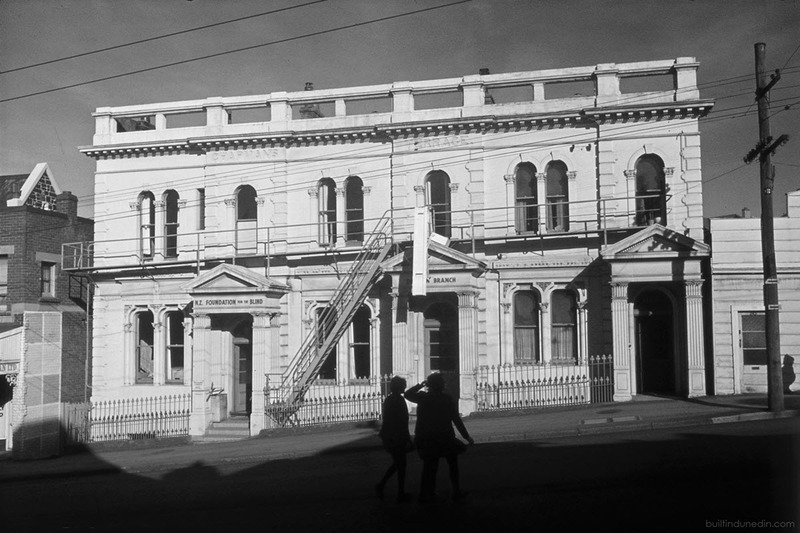 The Sandow School of Physical Culture used the premises from 1901, and in 1904 was succeeded by the Otago School of School of Physical Culture, continued by J.P. Northey from 1906 to about 1953. Northey is remembered today as a pioneer of physical education in New Zealand. In the illustration below words can be seen emblazoned on the walls next to the stage, reading ‘Breathe more air and have richer blood’, and ‘Deep breathing is internal exercise’. Northey’s School of Physical Culture in the Sussex Hall. Ref: Alexander Turnbull Library PAColl-0318-01. Dance studios operated in the building from the 1950s through to the 1980s. Shona Dunlop-MacTavish ran one of the first modern dance studios in New Zealand, and other instructors and groups included Laura Bain, Lily Stevens, Serge Bousloff (formerly of the Borovansky Ballet), Helen Wilson, Robinson School of Ballroom Dancing, the Ballet School, Southern Cross Scottish Country Dancing Club, Otago Dance Centre (Glenys Kindley and Alex Gilchrist), and Meenan’s School of Ballet. The New Edinburgh Folk Club also had its first rooms in the building. 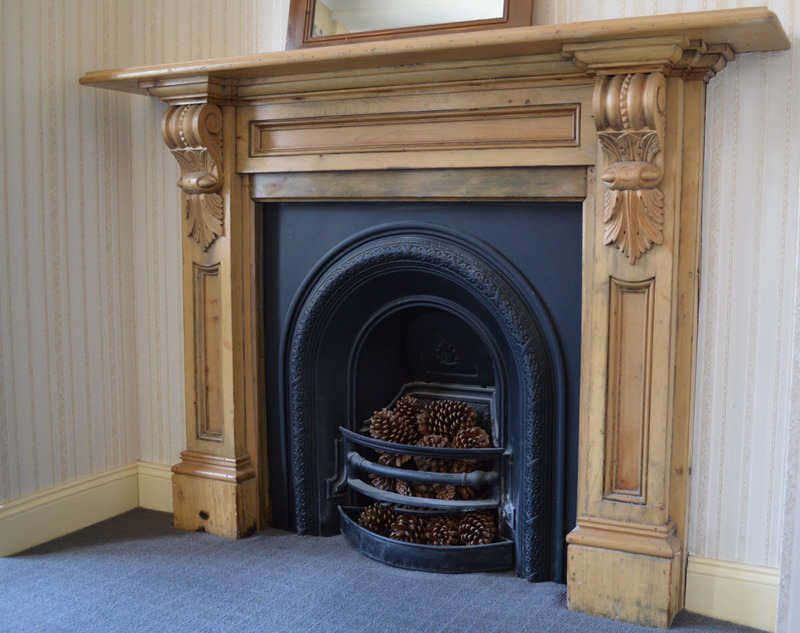 There have been many physical and practical changes to the building. It has been lit by electricity since 1898. A bullnose verandah was added in the 1890s and replaced by a suspended one in 1933. Major additions at the back were made in 1908 (Luttrell Bros architects) and 1936 (Miller & White), replacing earlier structures. An air raid shelter was built after the Japanese bombings of Pearl Harbor and Darwin in 1942, and it was one of many constructed in the central city at the time. 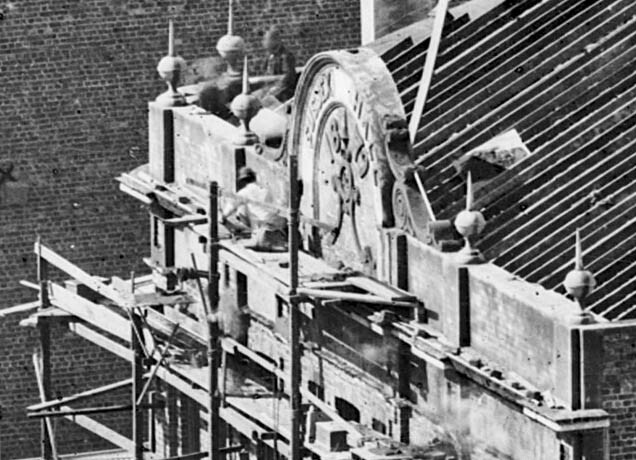 The finials and pediment were removed prior to 1930 and the front of the building was replastered in utilitarian fashion in 1956, with the loss of many original mouldings. Window canopies date from the 1990s. Blacket Lane remains one of Dunedin’s most fascinating and beautifully layered urban alleys, with high walls of mixed stone and brickwork. From 1979 a succession of appliance stores operated from the retail space formerly occupied by Wardells. These were Kelvinator House, Wilson Neil Appliances, and Noel Leeming. 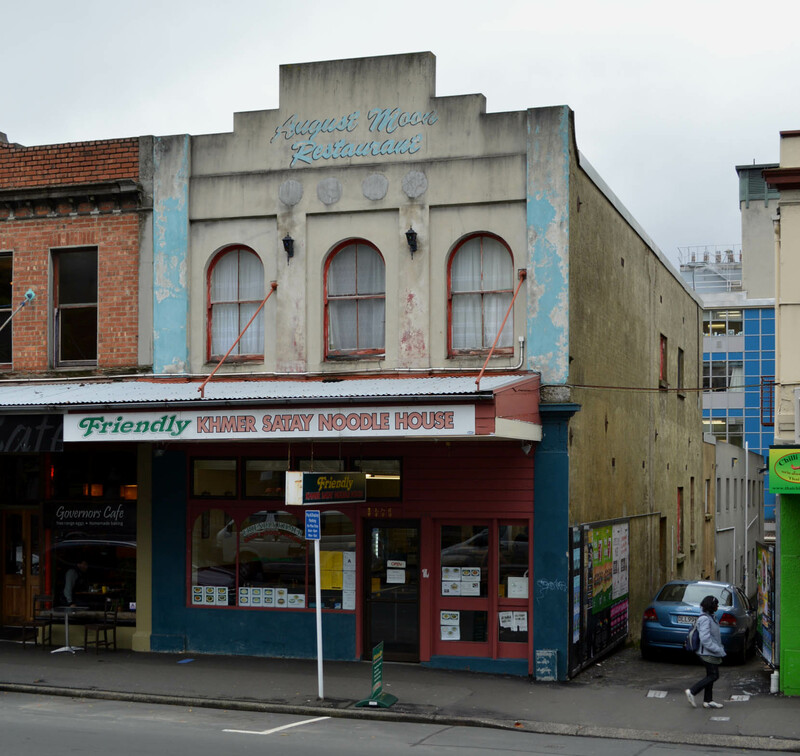 In 1995 the Champions of Otago sports bar opened at the rear of the ground floor, and in 2006 this was replaced by Fever Club, a 1970s disco-themed bar. 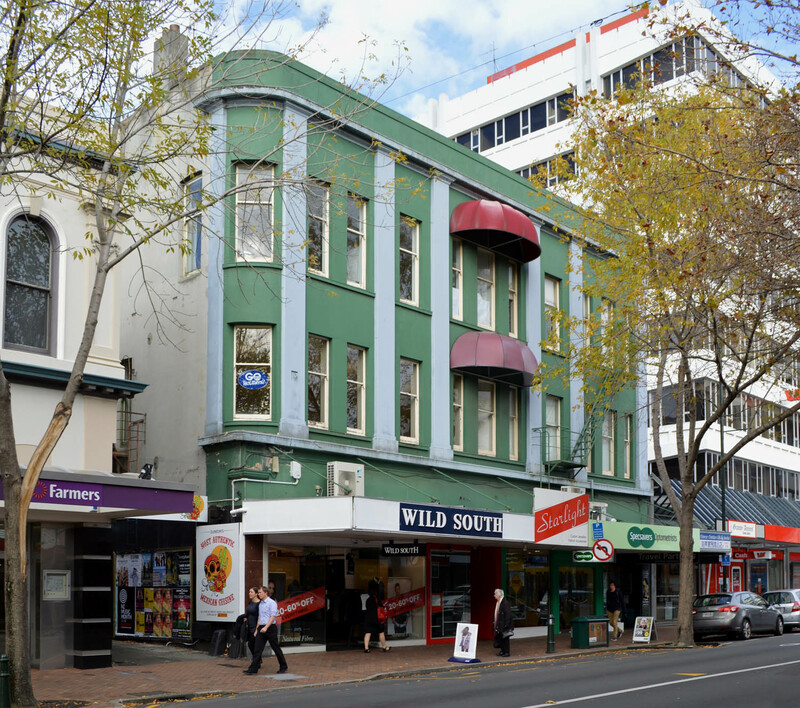 Wild South and Specsavers now occupy the ground floor shops, while businesses upstairs include Starlight , Chinese Christian Books & Gifts, Travel Partners, and Alan Dove Photography. The use of the building continues to be diverse, as it has been since 1880. 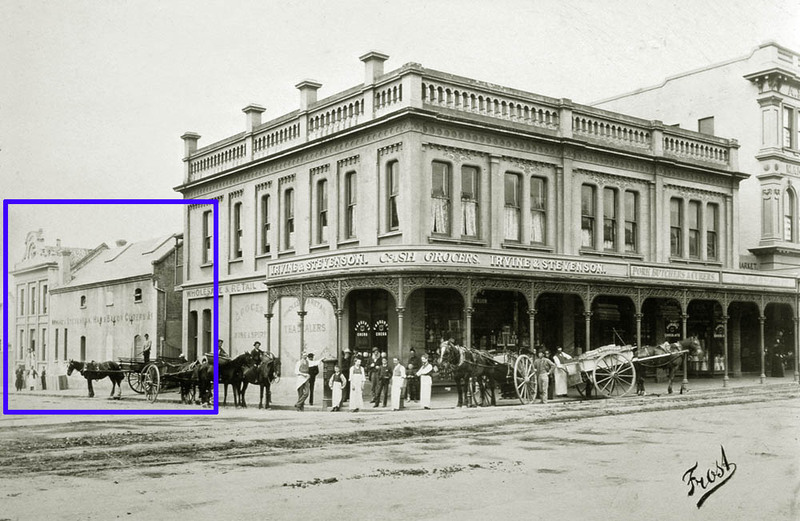 Otago Daily Times, 21 June 1865, p.4 (establishment of Sussex Hotel), 16 November 1877 p.3 (additions designed by Winchester), 27 February 1880 p.3 (description of building), 21 June 1880 p.2 (monkey and baboon), 8 July 1880 p.3 (dinner), 27 August 1880 p.1 (concert), 4 September 1880 supp. p.1 (railway employees), 7 January 1881 p.2 (butchers), 21 September 1881 p.2 (Antonio), 6 July 1882 p.1 (boxing classes), 8 August 1882 p.3 (baboon), 27 April 1901 p.1 (physical culture), 11 July 1908 p.11 (physical culture), 17 September 1995 p.B12 (Champions of Otago opens), 17 November 2006 p.24 (Fever Club opens). Council of Fire and Accident Underwriters’ Associations of New Zealand. 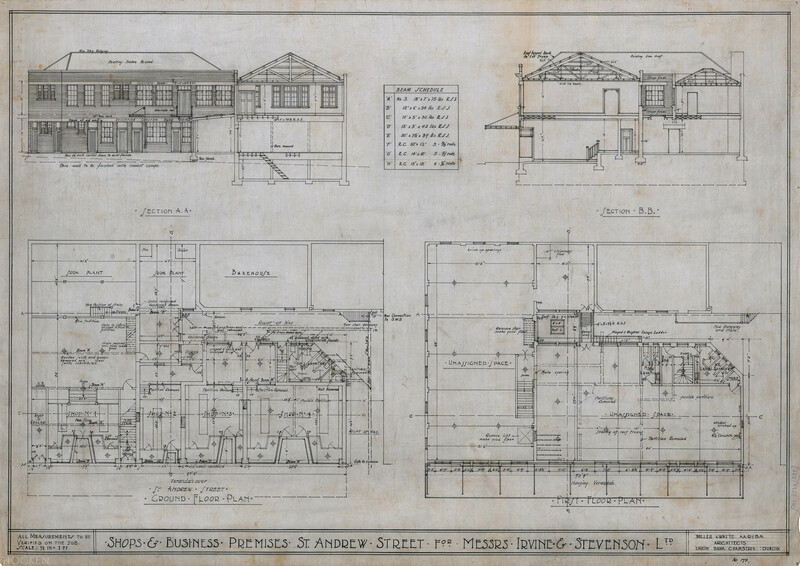 Block plans, 1927. Baré, Robert. 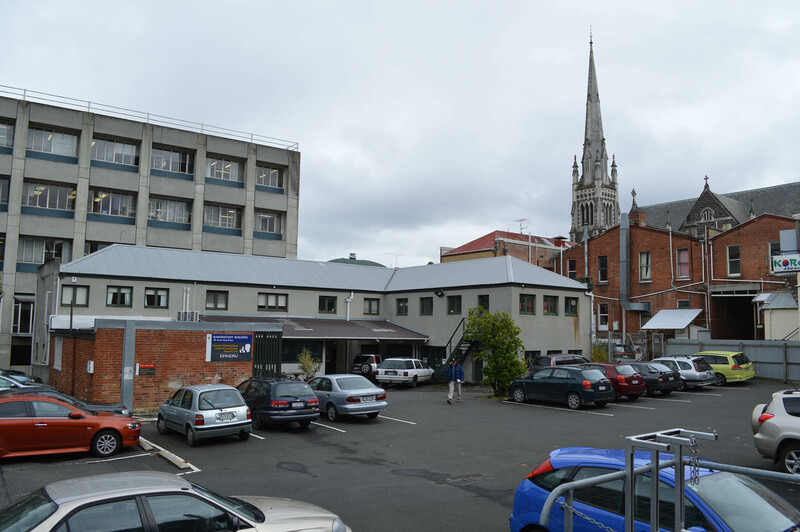 City of Dunedin Block Plans Dunedin: Caxton Steam Printing Company, . Calvert, Samuel (engraver after Cook, Albert C.). Dunedin, published as a supplement to the Illustrated New Zealand Herald, July 1875. Dougherty, Ian. 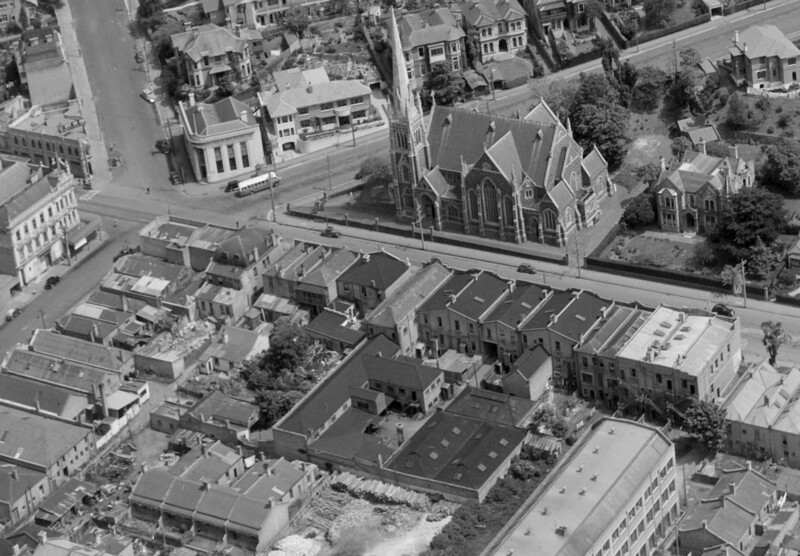 High Street Shopping and High Country Farming: A History of Wardell and Anderson Families in Otago. (Dunedin: Mahana Trust, 2009). Jones, F. Oliver. Structural Plans of the City of Dunedin NZ, ‘Ignis et Aqua’ series, . Paul, Margaret. 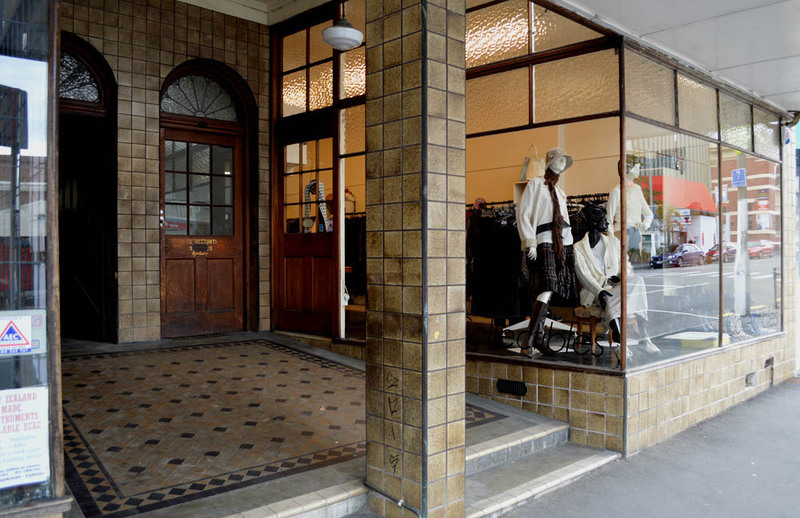 Calico Characters and their Clientele: A History of A & T Inglis Department Store, Dunedin, 1863-1955. Nelson: M. Paul, 1998. Wardells (Dunedin) Ltd price lists, Hocken Collections MS-4076/001. 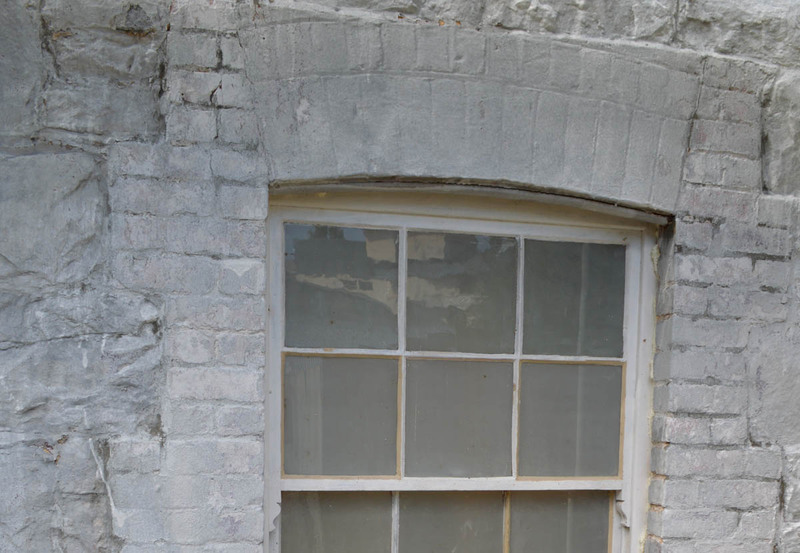 This entry was posted in Buildings and tagged 1880s, Dancing, Grocers, Hotels, J.P. Northey, John Brennan, Physical Culture, Renaissance revival, Robert Forrest, Sussex Hall, Sussex Hotel, Thomas Oliver, Wardells on 31 May 2015 by David Murray. 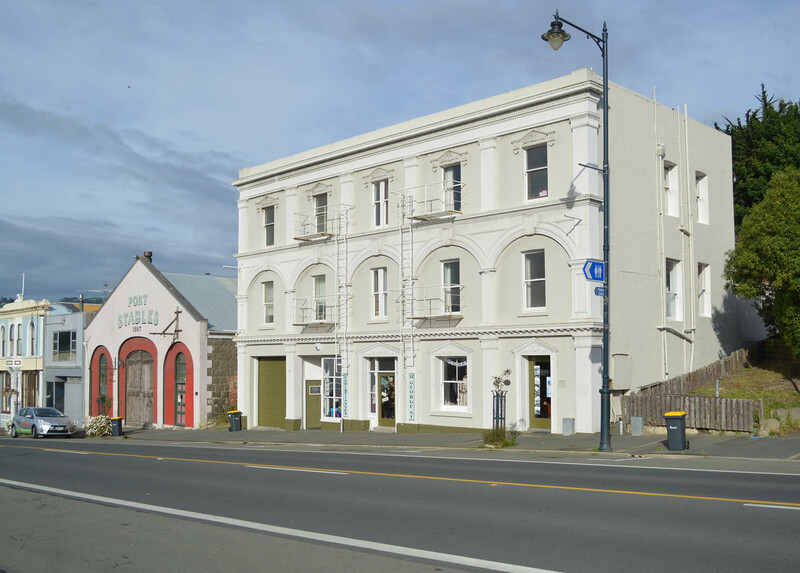 In 1880 Gordon McKinnon was a young architect and contractor based in Port Chalmers, with commissions to design and build two hotel buildings in George Street. Born in Peterhead, Scotland, in 1856, he was the son of Captain Gordon McKinnon, a former whaling ship master who took his family to Otago in 1862. The seaman later captained various vessels and worked as a coastal pilot. 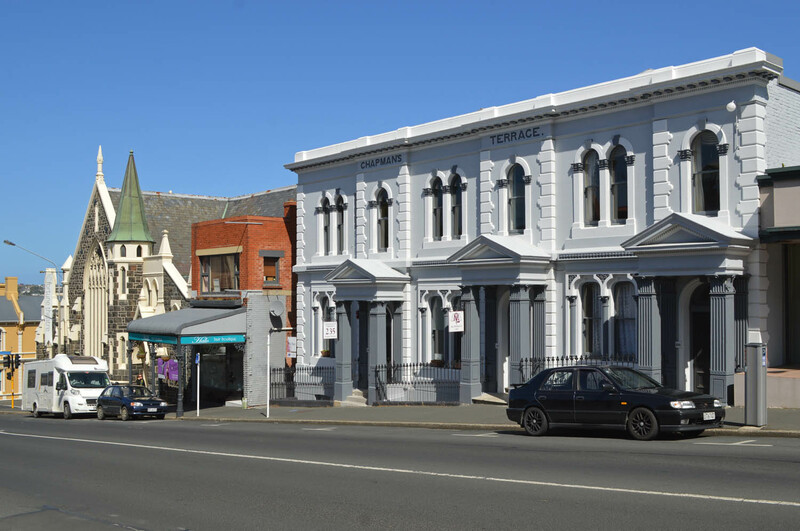 Despite the promising start to his career, the younger McKinnon is not mentioned in any books about Dunedin architecture, and the hotel buildings appear to be his most significant works in New Zealand. This made me curious! 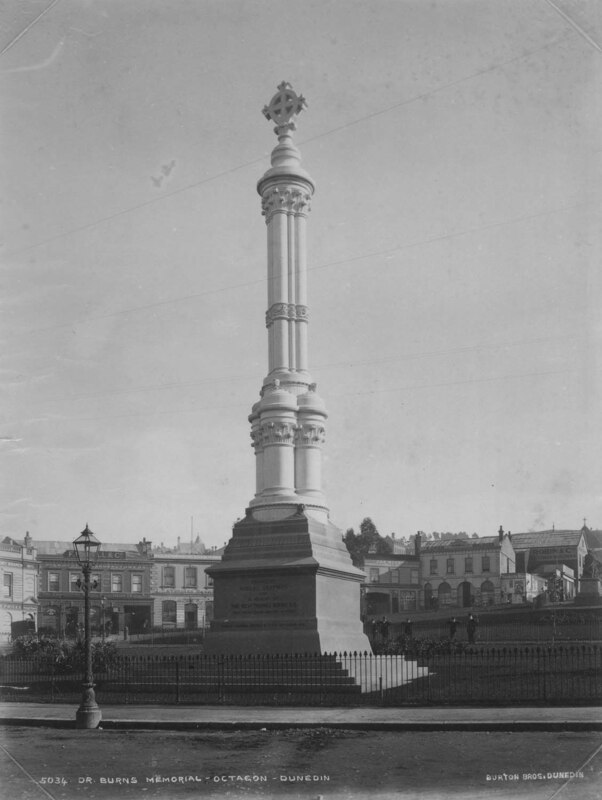 We have before noticed the fact that many improvements are being carried on in Port Chalmers and among the most prominent of them is the very handsome structure now in course of erection for Mr [William] McLauchlan. It is intended for a hotel, and is situated in the very centre of George street. 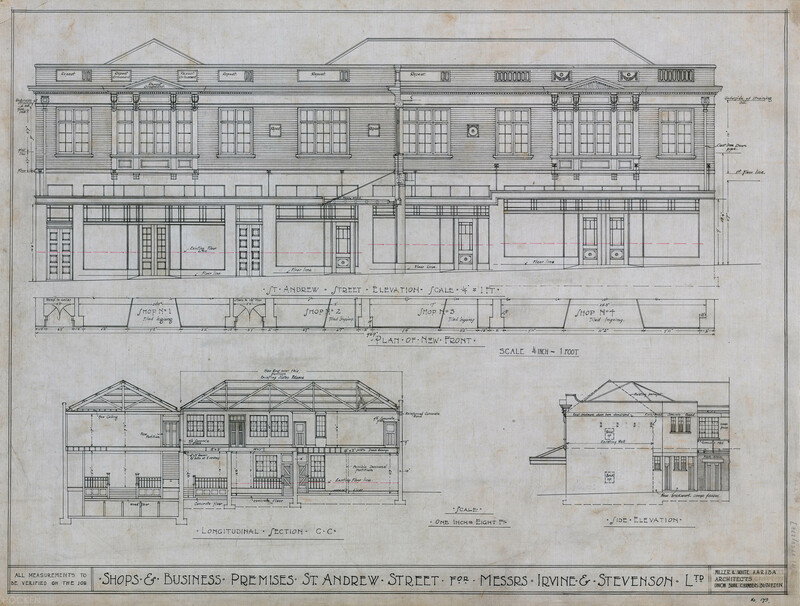 The style of the building is the decorated Italian, and is from the pencil of a young though very capable architect, Mr Gordon McKinnon, who, although not a native of the Port, has been connected with it from his earliest infancy, and it affords us very great pleasure to record the fact of so fine a building being erected from the designs of this meritorious and rising young artist. 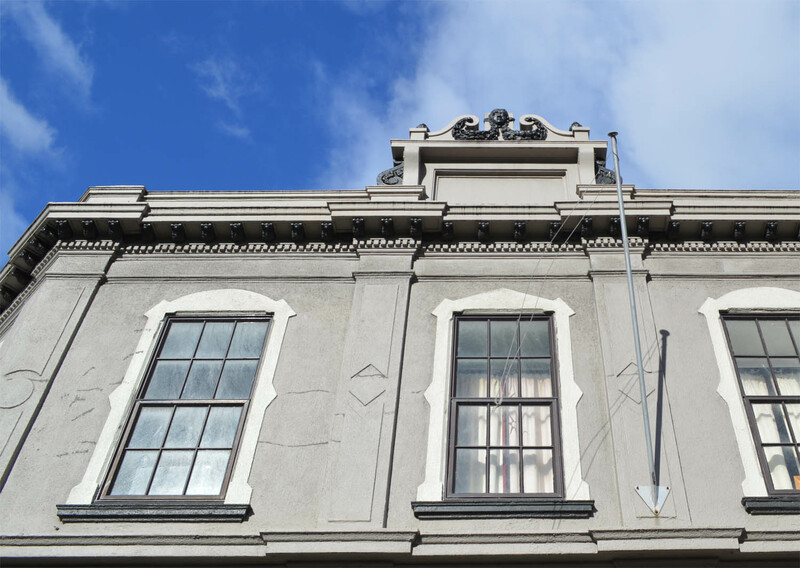 The edifice is of the most solid character, being composed of Port Chalmers bluestone foundation, with brick and cement upper works. The Marine Tavern in the early 1970s. Photo by Daphne Lemon, Hocken Collections S14-585a. Inside, the ‘very ornamental’ public bar was adjoined by a snuggery, and there was also a commercial room with a separate street entrance. Assembly and dining rooms could be combined to form a single large space for balls, concerts, and other gatherings, serviced from a kitchen at the rear. Through the central street entrance was a grand staircase with elaborately-cut woodwork balusters, and on the first floor were a sitting room, four double bedrooms, six single bedrooms, toilets, warm and cold baths, and showers. 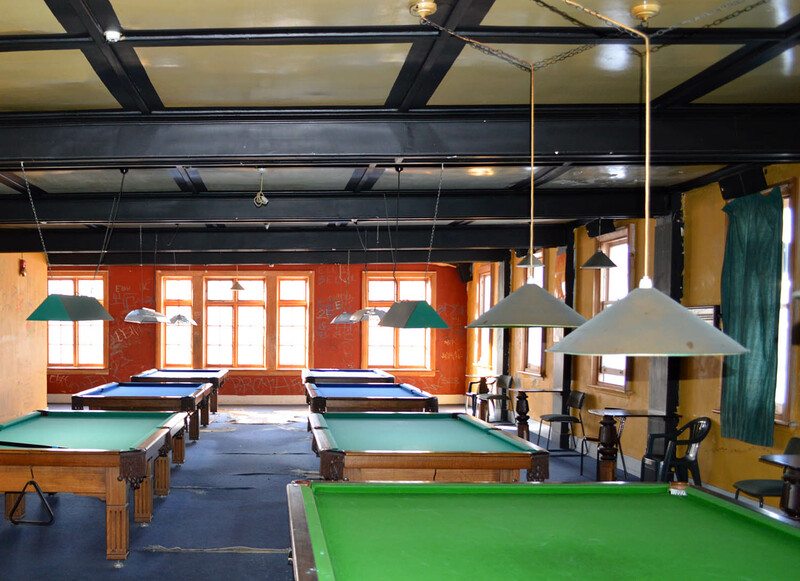 A large billiard room was described as ‘one of the handsomest we have seen, its decorations being extremely tasteful and elegant, and the ceiling, which is a masterpiece of plasterwork, is to be finished by a centre flower and elaborate cornice’. A license was issued in September 1880, with John Thomson the licensee. 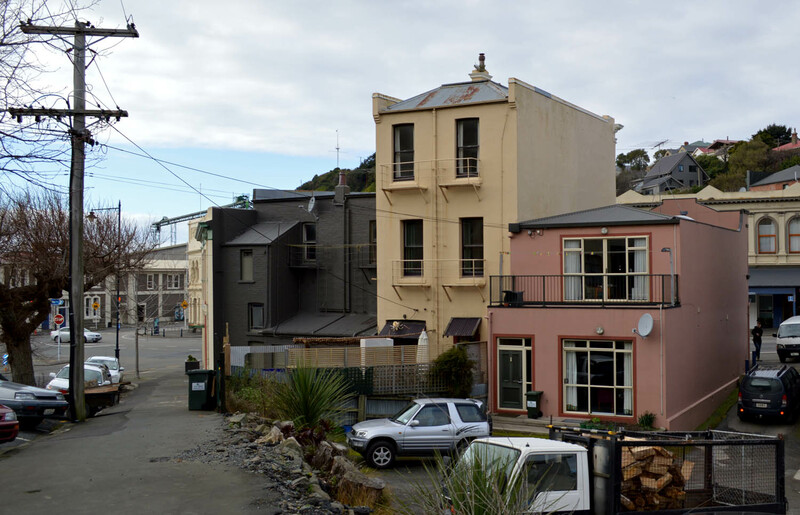 The hotel survived the 1902-1905 no-license period in Port Chalmers and the longest serving publicans were Edward McKewan (1909-1923) and Fred Carter (1926-1947). 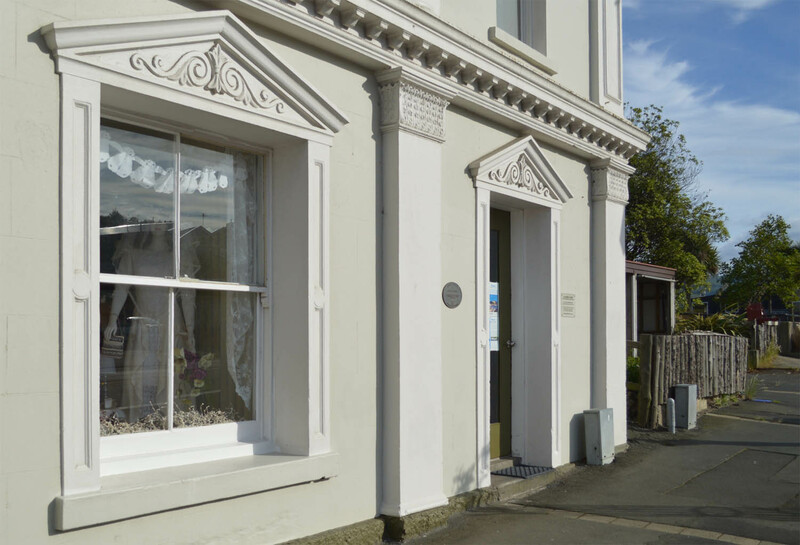 One of the claims for the Marine was that it was the first hotel in New Zealand to participate in a meals-on-wheels scheme for the elderly, which began in 1965. 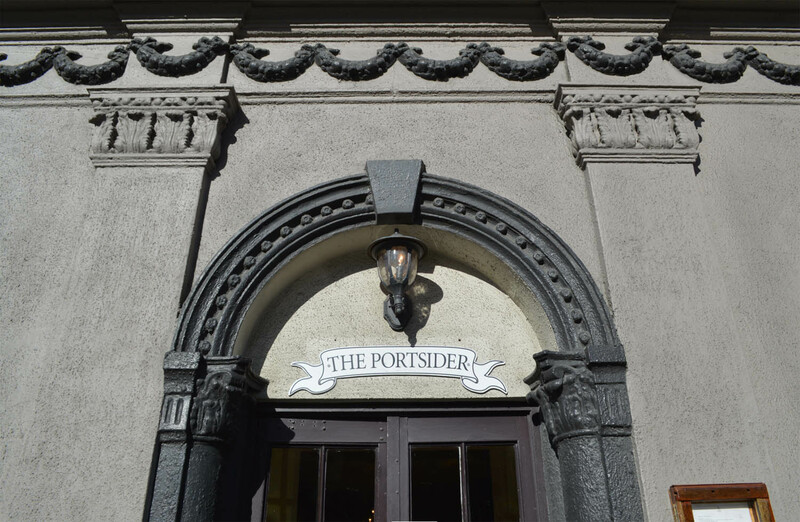 The hotel became the Marine Tavern in 1967 and in 1976 closed for extensive rebuilding and renovations before reopening as the Portsider Tavern in 1977. The redevelopment project was designed by Allingham Harrison & Partners and included major rearward and southward extensions, and internal rearrangements. Today the exterior retains most of its original decorative features, including pilasters, Corinthian capitals, cornices, swags, and a scrolled pediment. 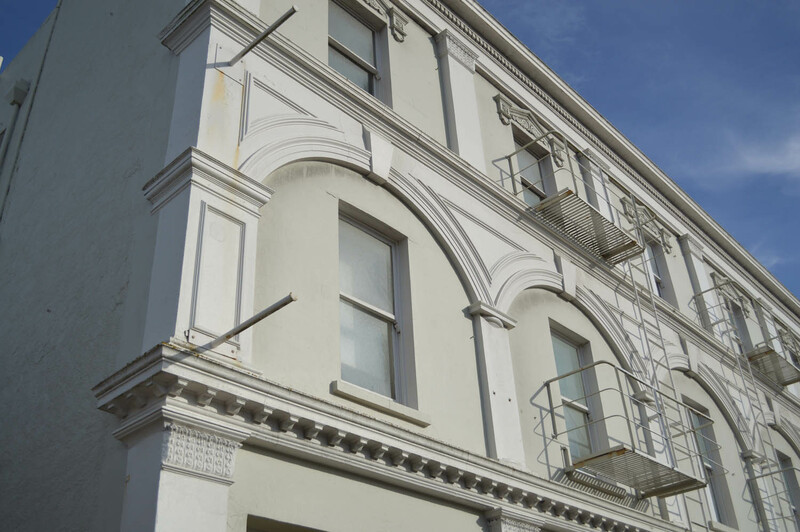 Finials that originally surmounted the blind parapet have been removed and entrances and windows have changed, with somewhat awkward new arches combined with mullioned aluminium-framed bay windows. The render finish to the facade now has a slurry coat. 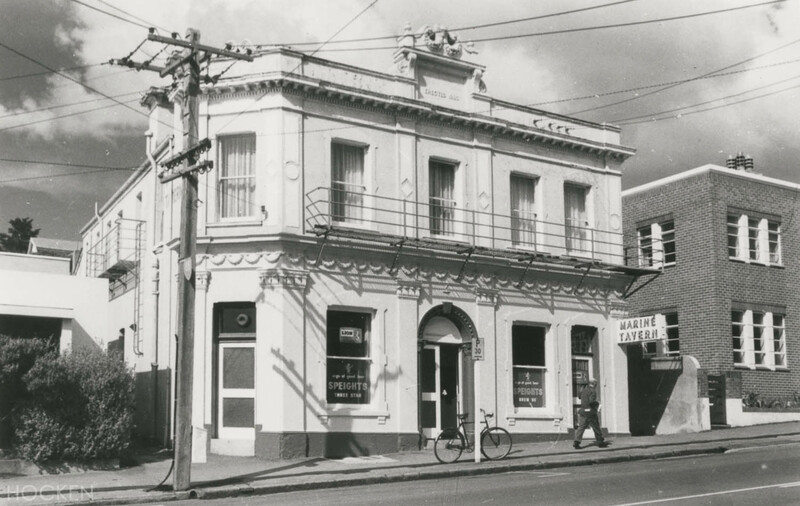 McKinnon’s other hotel project was the partial rebuilding of the Royal Hotel. This hostelry had been established in 1861 with Thomas Christmas Bowern as licensee, and a photograph taken later in that decade shows a large three-storey timber structure with a separate stone and brick stable (the latter was built in 1867 and still stands). 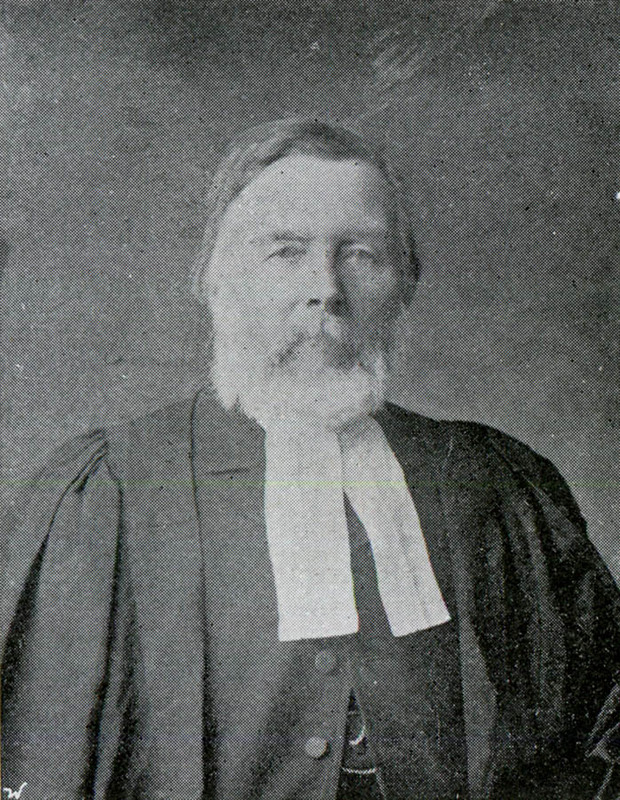 From 1876 the proprietor was James Morkane, a ‘zealous and practical’ Catholic from Tipperary, Ireland, five of whose ten children joined religious orders. 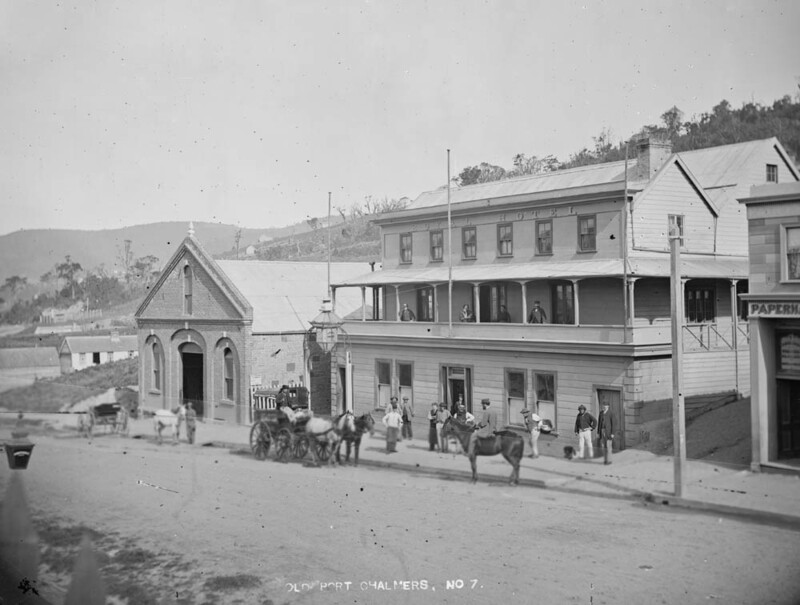 Between 1880 and 1881 the front portion of the hotel was rebuilt for Morkane to McKinnon’s design, with a foundation of Port Chalmers bluestone and walls above in brick. 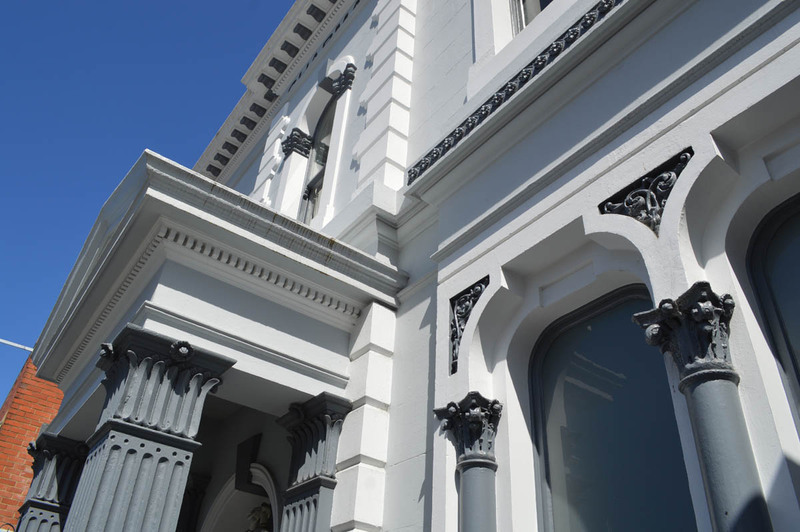 The new frontage for the Royal was described in the Otago Daily Times as very handsome and ornamental in character, with a ‘chastely decorated’ facade finished in cement render. 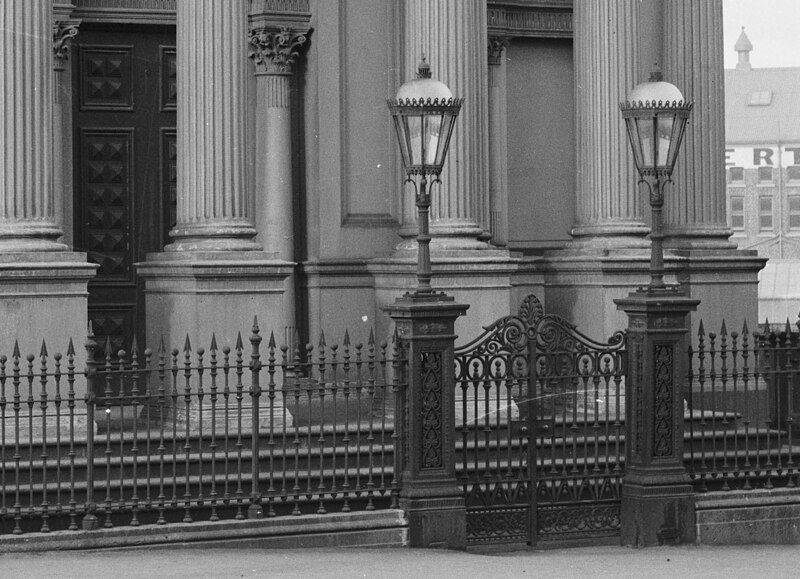 A first-floor loggia with large Doric pillars and ornate cast-iron railings extended along the front of the building. 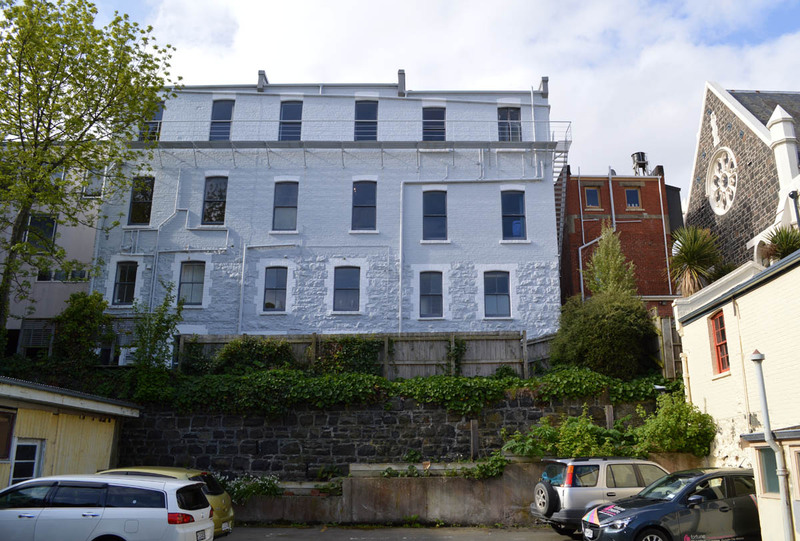 This feature was unusual in Dunedin but less so in Australia, and had many precedents in the Italian Renaissance architecture that was the revived style used for the design. On the ground floor were a spacious billiard-room, bar, and bar parlour, approached by a lofty entrance hall with a handsome staircase leading to the first floor, on which there was a large dining room and two sitting rooms. 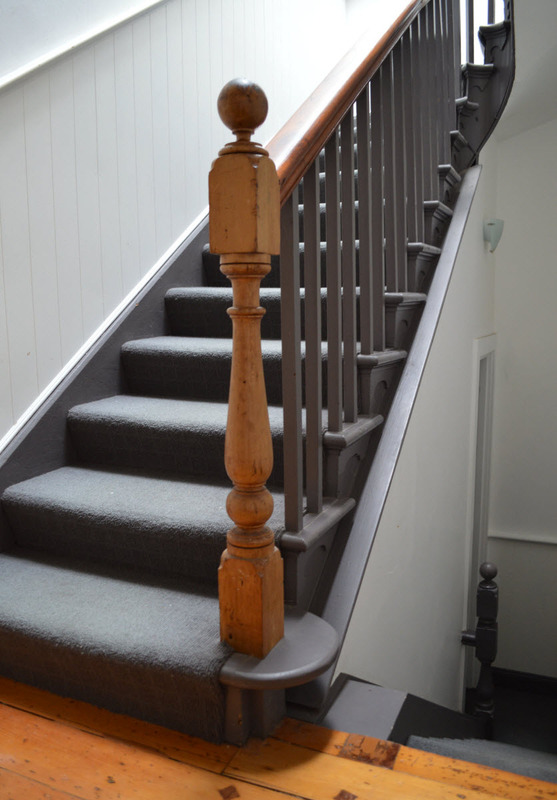 On the second floor were six new bedrooms ‘fitted with the most recent appliances for comfort’. 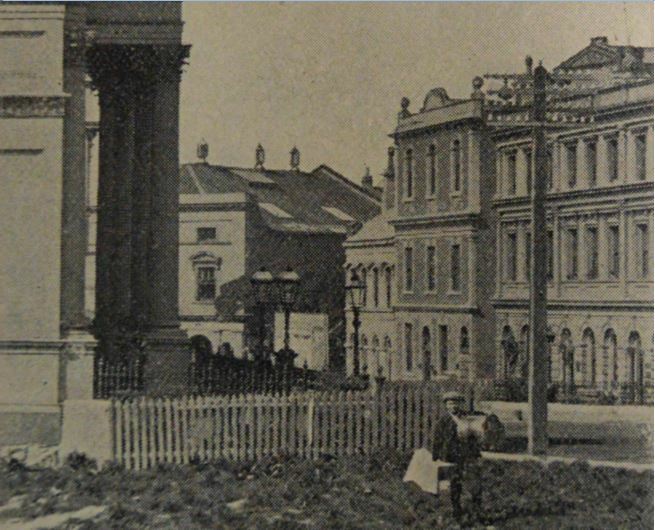 The Royal Hotel in the late 1860s, with the stable buildings on the left. Photo by D.A. De Maus, Alexander Turnbull Library 1/1-002555-G. 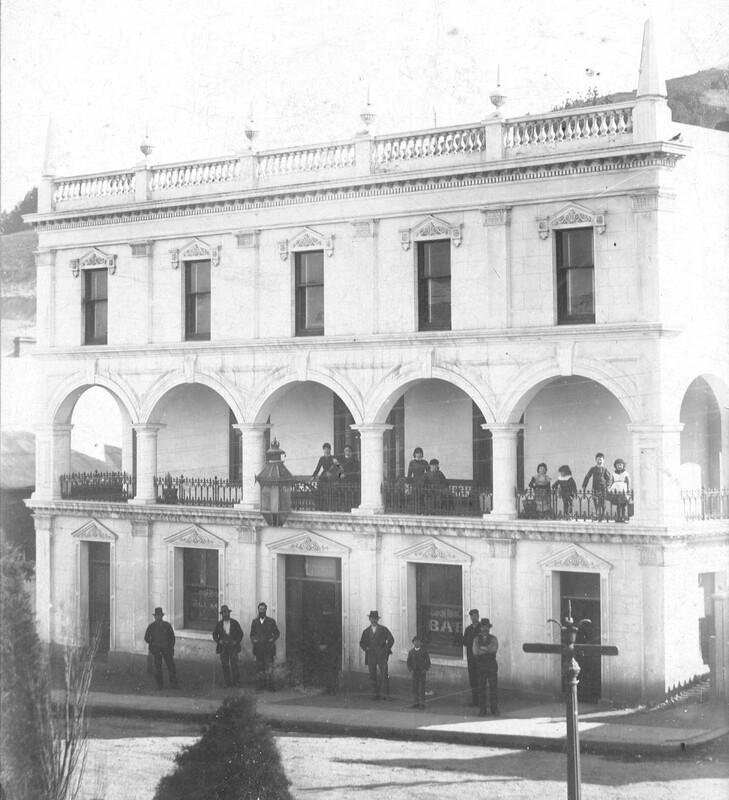 The rebuilt Royal Hotel frontage as it appeared in the 1880s. Photo courtesy of Port Chalmers Maritime Museum Collection. Plans to rebuild accommodation in the rear portion of the hotel appear not have been realised, as the hotel was refused a license in 1885 when it was described as being in a ‘dilapidated and ruinous condition’. The buildings afterwards became a club and a boarding house, and the rear part was eventually demolished. The main uses of the McKinnon-designed portion have been residential, with shops on the ground floor. The loggia was built in at some time before 1920, a balustraded parapet and finials were removed in 1947, and fire escapes were added in 1951, but the building retains much of its original character. And McKinnon? He was declared bankrupt in 1881, likely as a consequence of the hotel projects, and left Dunedin before he could create a sizeable body of work. He went on, however, to enjoy a successful career as an architect in New South Wales, where he established the firm Gordon McKinnon & Sons. 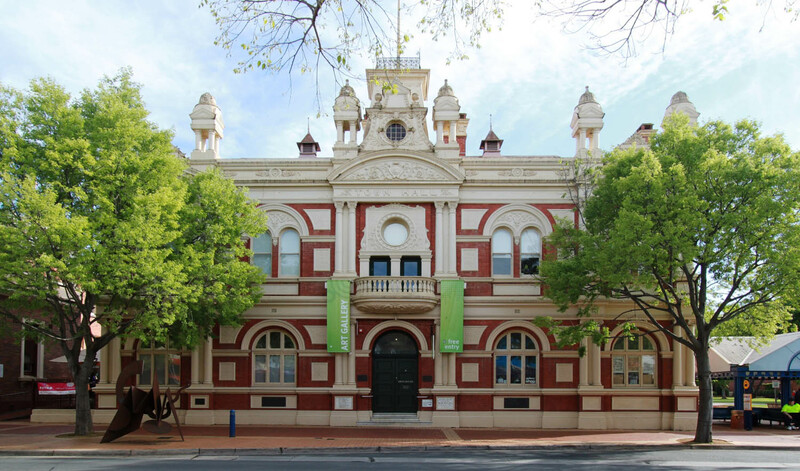 His designs included the Parramatta Park gatehouse, Cherrybrook Uniting Church, the School of Arts at Bowral, Symonds’ Building in Sydney (Pitt Street), additions to the house Adamshurst at Albury, and the town halls in Forbes, Inverell, and Albury. He died of heart failure at Katoomba, New South Wales, on 30 June 1922. He was survived by his wife and five sons. 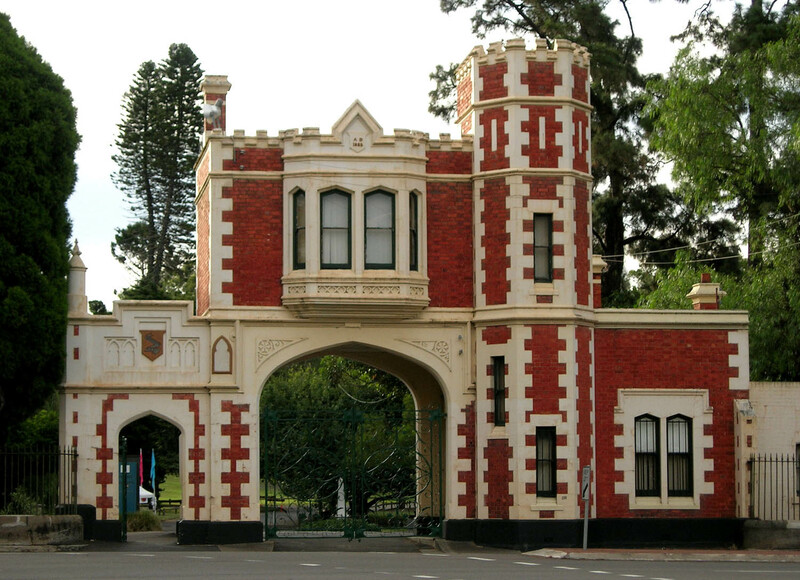 Parramatta Park gatehouse (1885). Photo by Ryan Tracey. 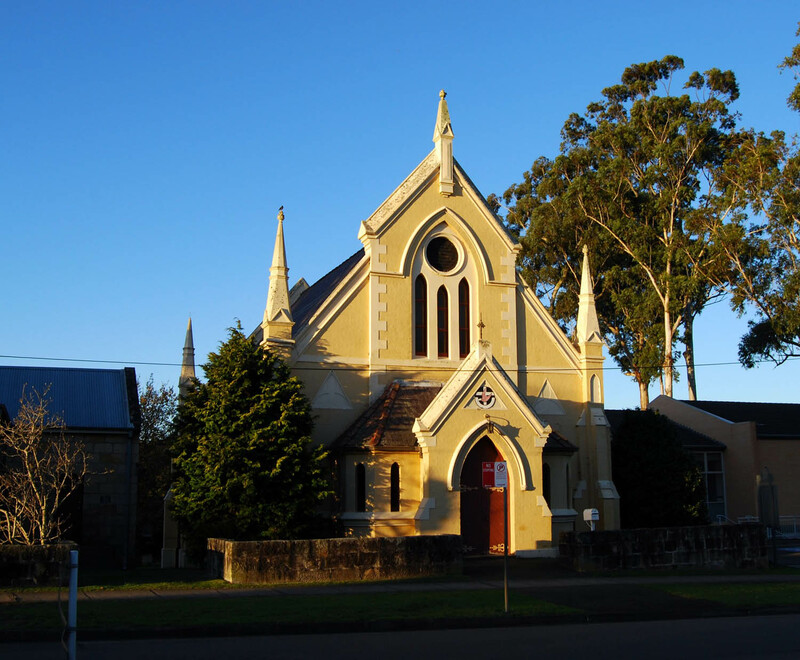 Cherrybrook Uniting Church (1889). Photo by Peter Liebeskind. Forbes Town Hall (1891). Photo by Mattinbgn. 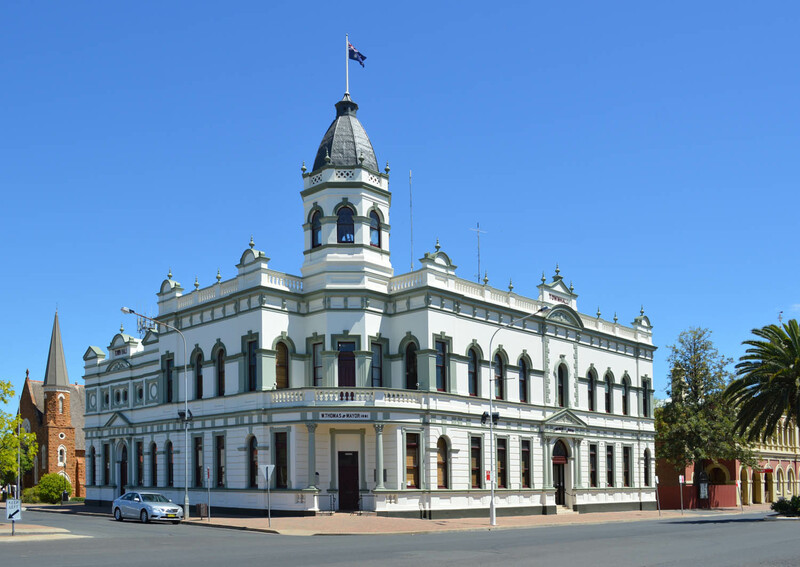 Albury Town Hall (1908). Photo by OZinOH. 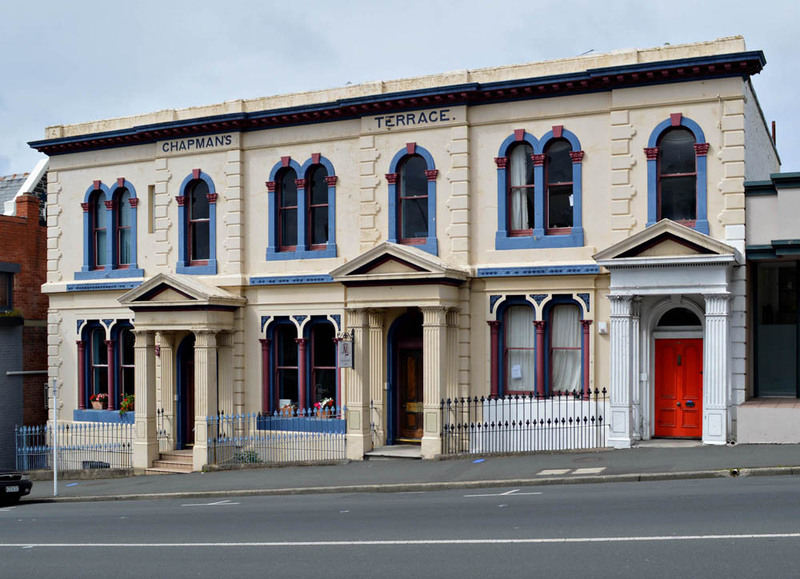 This entry was posted in Architects, Buildings and tagged 1880s, Gordon McKinnon, Hotels, James Morkane, Marine Hotel, Port Chalmers, Portsider, Renaissance revival, Royal Hotel, Sydney on 22 December 2014 by David Murray. Detail from photograph by D.A. De Maus taken in March 1900. Ref: Port Chalmers Maritime Museum. 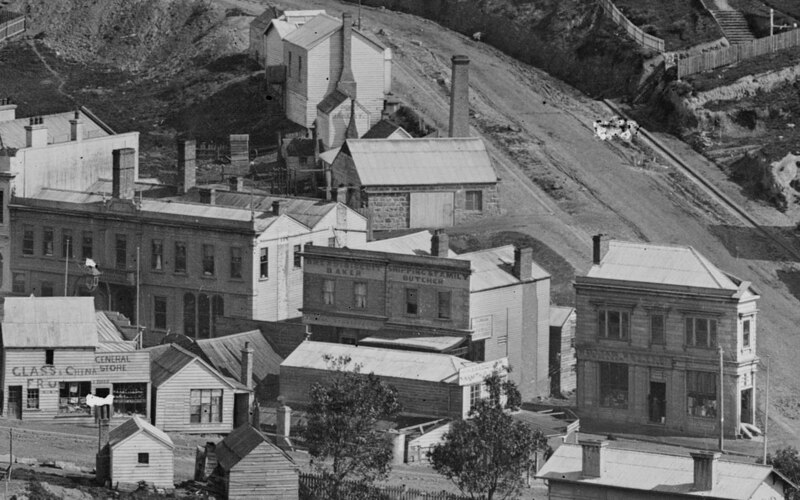 Port Chalmers was home to fewer than 130 inhabitants in 1861, but within five years its population increased to over 2,000 due to the town’s function as the major port servicing a booming province in the midst of a gold rush. 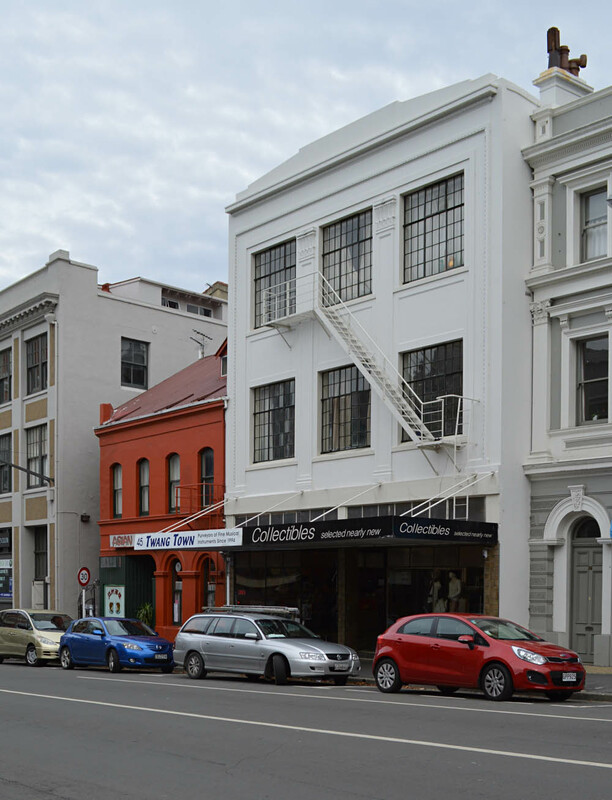 By the end of the decade George Street, the main thoroughfare, included a variety of double-storey commercial buildings, mostly constructed of timber. 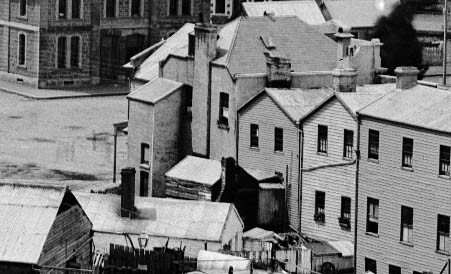 Photographs taken in the 1860s and 1870s show the site at 6 George Street as a vacant lot between two-storey wooden buildings. 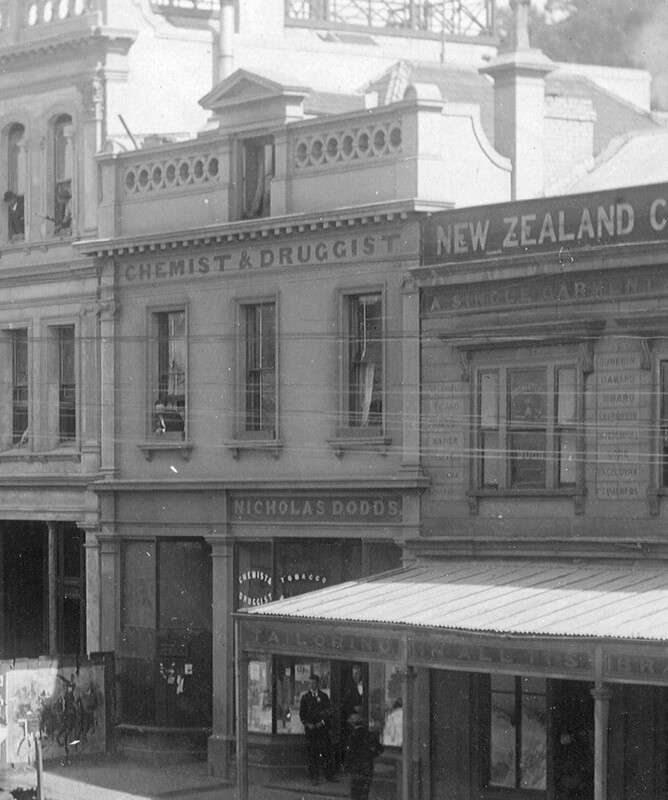 In April 1881 the architect David Ross called for tenders for the ‘erection of two shops and dwelling in Port Chalmers for Mr George F. Dodds, chemist and druggist’. George Fawcit Dodds (1838-1894) was born in Jedburgh, Scotland, and had worked for twenty years in a ‘leading house’ in Scotland. Detail from a mid-1870s Burton Brothers photograph showing the empty building site, immediately to the right of the sign reading ‘Shipping & Family Butcher’. The buildings fronting George Street are of timber construction. Ref: Te Papa C.011806. 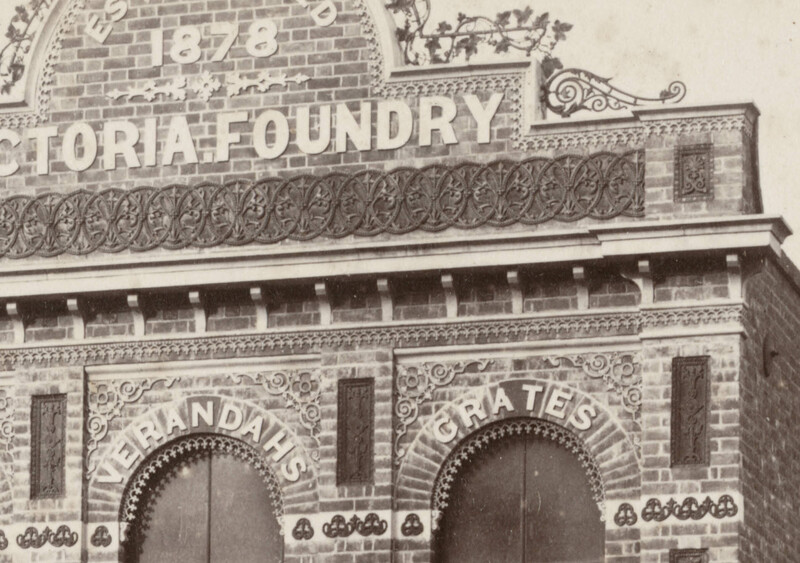 Detail from a Burton Brothers photograph taken in the 1880s, showing the building from the rear. It is the one with the higher roof. Ref: Te Papa C.011788. 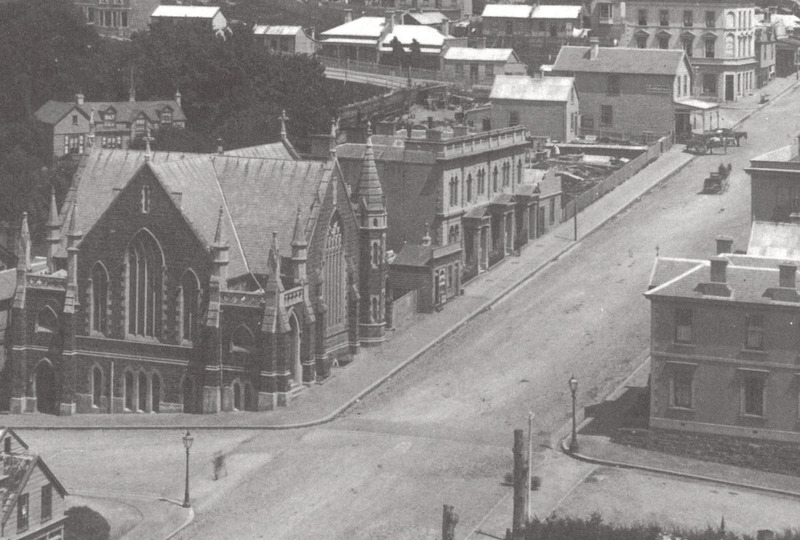 A photograph taken in 1900 shows that the northern shop was larger than the southern one. 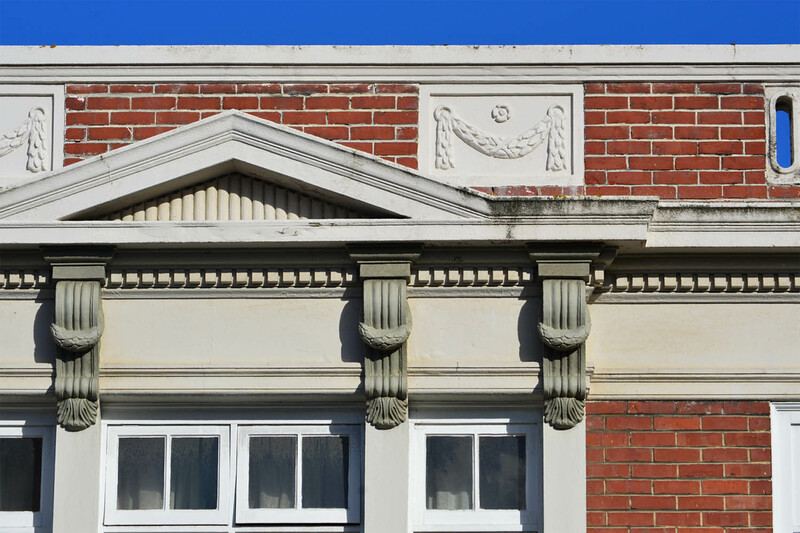 The style of the architecture was Renaissance Revival, with decoration including Ionic pilasters and a dentil cornice. The parapet balustrade featured the repeating circle motif that was a signature ornament of David Ross. At the centre was a dormer window with a small triangular pediment above. 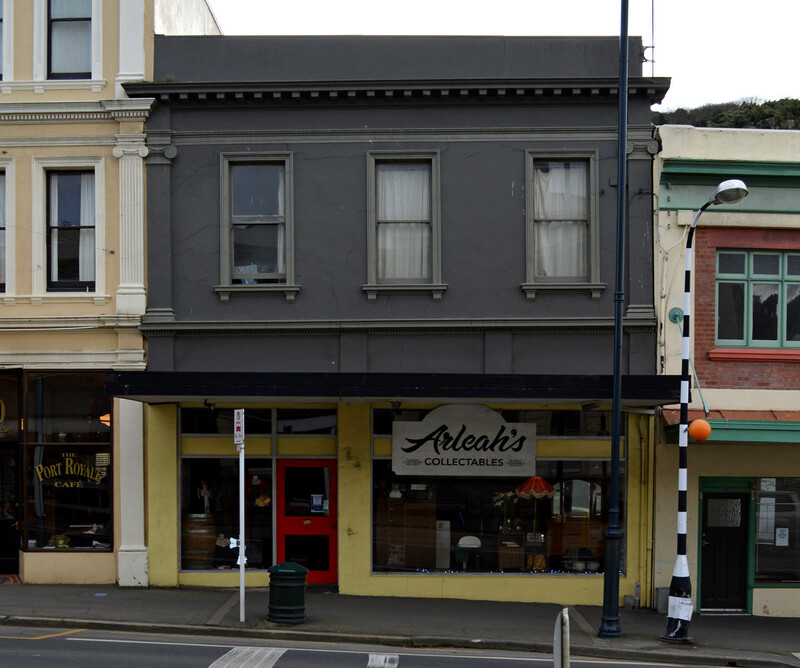 In 1888 G.F. Dodds moved to Akaroa and was succeeded in the Port Chalmers business by his son, Nicholas Dodds (1864-1939), who continued on the site for the next fifty years. 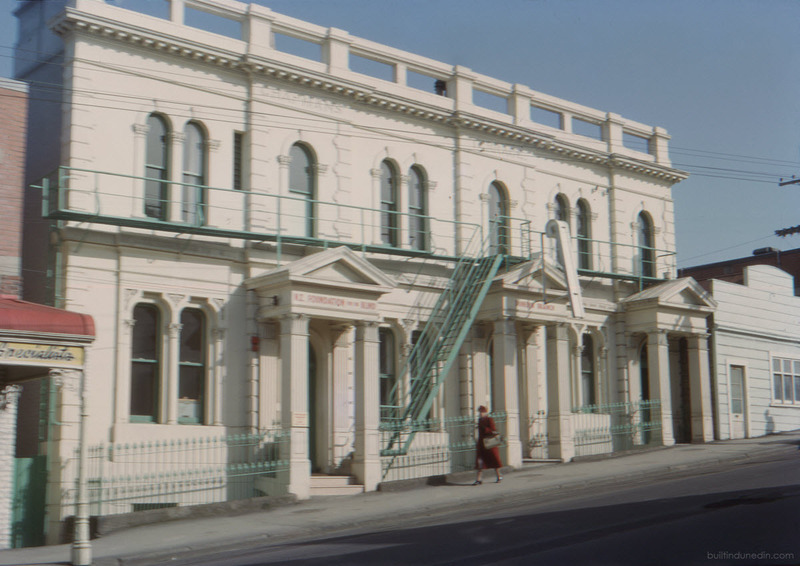 It became the UFS (United Friendly Society) Dispensary around 1938, when the UFS moved from its previous address in Grey Street. 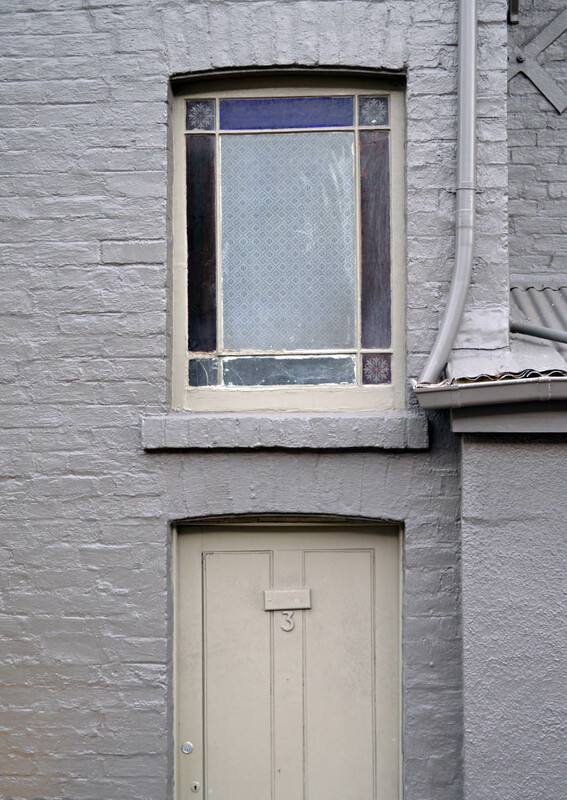 It remained at 6 George Street until 1987, when it moved to no. 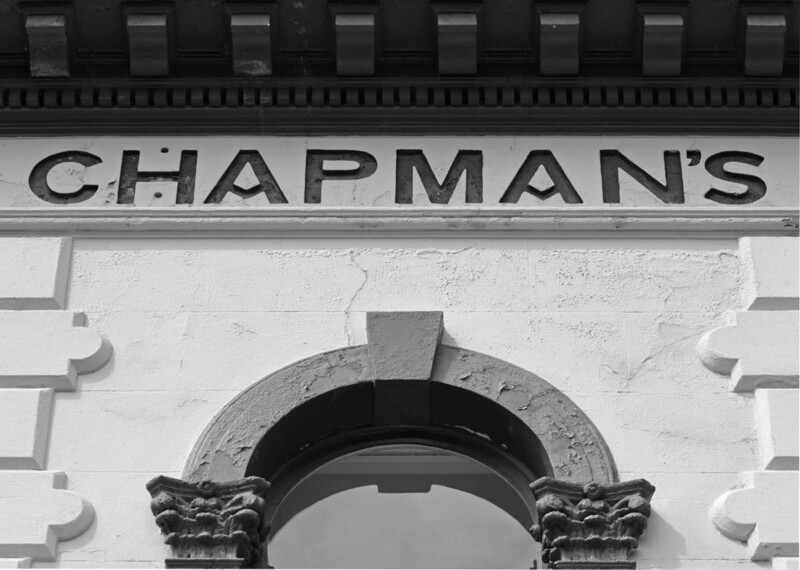 27, ending 106 years of pharmacy operations in the building. The smaller shop initially appears to have been used by G.F. Dodds and then Samuel Wilson as a lemonade/aerated water factory. It was afterwards occupied by watchmaker James Falconer (c.1892-1898), William Gowan Fail (c.1898-1901), an Evening Star Co. branch office (c.1901-1927), milliner Miss M. Millar Tait (c.1927-1929), and bootmaker Ernest Carl Brown (c.1930-1935). Later changes included new internal partitions (1940), the addition of fire escapes (1951), and further alterations (1964, 1974). The two separate shops have been combined to make one large one, and the original roof structure with attic level has been removed and replaced with a flat roof. The dormer window and ornamented facade parapet have been replaced with a plain blind parapet, giving the facade a more anonymous appearance than it once had. In the 1990s the building housed the shop Presence, and it is now home to Arleah’s Collectables. Church, Ian. Port Chalmers Early People, pp.182-183. Thanks also to Gordon Allfrey of Port Chalmers Maritime Museum. 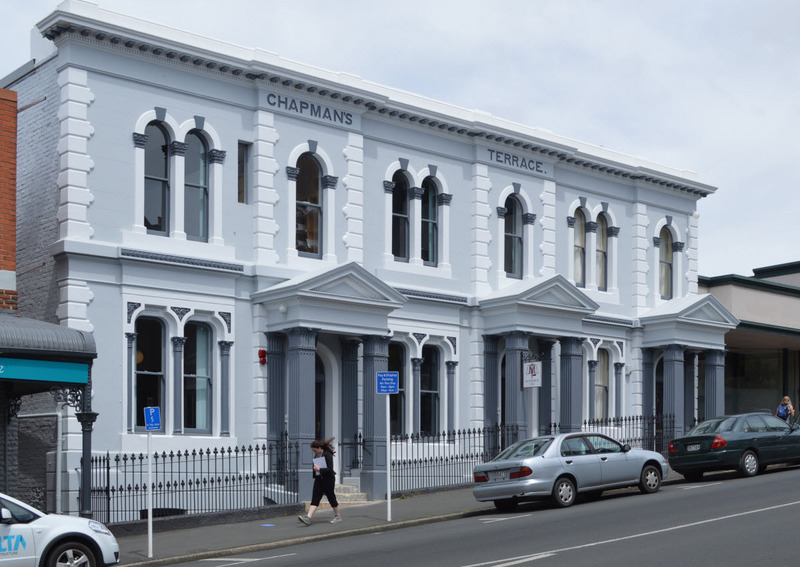 This entry was posted in Buildings and tagged 1880s, Chemists, David Ross, Port Chalmers, Renaissance revival on 22 September 2014 by David Murray.